If you have a file (eg. CoreldDRAW file of 85MB) larger than the 64MB memory capacity of the DCP-J552DW, plus the printer is non-expandable, would the printer be able to print the image out? Does it just take longer to print whereby it stores and prints the first 64MB then has to store and print the remainder. Or would it hang, unable to print because it would not cope because it could only store 64MB of the 85MB CorelDRAW file image? The file size should not be a factor in preventing your DCP-J552DW printer from printing the image. The Brother DCP-J552DW wireless colour A4 all-in-one inkjet printer is known for user-friendly operation, sleek design, and built-in wireless connectivity. Mobile scan and print support are supported by the Brother DCP-J552DW colour inkjet printer, making it easy to develop media over Google Drive, Flickr, Facebook, Picasa, and other online storage portals, but it lacks expandability. The copy function for colour output is also quite slow. The stylish Brother DCPJ552DW A4 machine is distinctive for its 6.8cm colour touchscreen display. Its standard paper capacity is 150 sheets, while the output bin can handle 50 sheets. The Brother DCP J552DW inkjet printer is a network-ready device with built-in wired Ethernet as another option for connectivity. There is a 1200x1200dpi copier, while the printer's resolution is up to 6000x1200dpi for very detailed and precise results. There is 64MB of built-in memory, but it's not expandable. 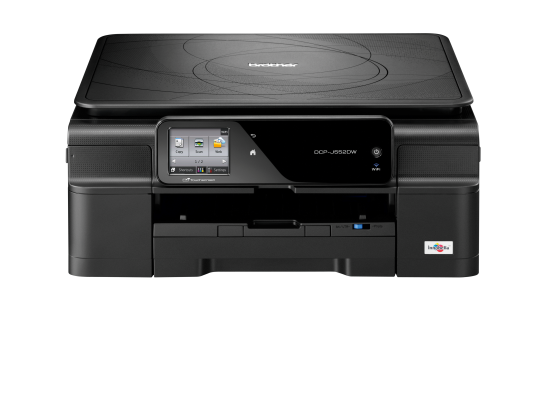 The DCP-J552DW is a multifunction printer with built-in copy and scanning functions. Enhanced connectivity features include seamless Cloud connection and mobile capabilities, making it easier to print directly from Android, Blackberry, Windows mobile, and Apple iOS devices. Touchscreen operation simplifies on-board configuration and navigation, while the impressive print speed of up to 12ppm enables users to save time. The Brother DCP-J552DW printer helps reduce print costs because of automatic double sided printing function, Ink Save mode, and high-yield Brother DCP-J552DW ink cartridges. Direct USB printing or scanning and PictBridge are supported. The fastest copy speed for colour documents is only up to 2.7ppm. The control panel of the Brother DCP-J552DW colour all-in-one might be too small and difficult to read for some users. The paper capacity of the DCP-J552DW cannot be upgraded, limiting this device to low volume printing.